Hike Messenger, one of the leading instant messaging platform in India has announced that they are bringing back the old-age ‘Status Updates and Feed,’ feature which apparently was removed five months ago in favour of the new trend- Stories. However, Hike claims that most of the people are asking for the feature, much like what people did with WhatsApp. Recently, WhatsApp removed its trademark status feature and introduced ‘WhatsApp Stories.’ Though most of the people loved the new stories, a feature on both the platforms, but they was genuinely missing the previous status feature, which they are used to since ages. “It’s been 5 months since we introduced Stories on hike and today hikers are consuming an enormous 1 Billion Stories every month! Stories is off to an incredible start,” says Hike in its blog. If you want to access the old status updates and feed feature, update the Hike app in your phone to the latest version. Head over to the Stories section and click on the three line button on top. This feature works same as how it worked previously. By pressing the button, you can see a stack based news feed of your friend’s statuses based on timing. Also, you can post your current mood and text status, which people missed badly. All said, it’s a welcome move from Hike and also the one to counter WhatsApp. The Facebook-owned WhatsApp is the most used platform in India with over 200 million users, but Hike has some unique features such as stickers, conference calling, Hike Direct, and more importantly, Hike Services. With the Hike Services, you can get news updates, cricket scores, coupons, etc. 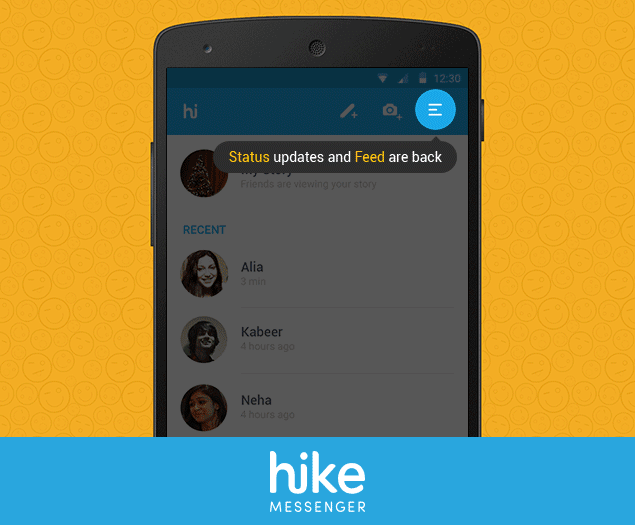 Hike Messenger better than whatsapp! Hike is my primary messaging app.